We live in an impatient generation. We want what we want and we want it now. Credit card companies are flourishing because we have lost the art of saving for big purchases and simply buy whatever we want, whether we have the money for it today or not. Fast food restaurants are big business and there are instant versions of many of our favourite foods, from oatmeal to pudding to rice. You can even buy pre-made Rice Krispie treats rather than taking the 10 minutes required to make your own! And, to be completely candid, I complained, while writing one of my Blogger's Quilt Festival posts, that my computer was driving me crazy because it was so slow that it couldn't keep up with my typing. Waiting is not our strong suit anymore. We are often just as impatient with God. Even with Him, we want what we want and we want it now. We think we know how things should work out, whether we're praying for healing or salvation for someone we love or a new job, or whatever it may be, and we can often be tempted to think that God works too slowly. That's why I was struck by this verse in Isaiah when I read it a few weeks ago: "I am the Lord; in its time I will do this swiftly" (Isaiah 60:22b). To give you a little context, this verse comes when the people of Israel have returned from their exile, but they are facing a lot of problems. Things aren't as good as they imagined they would be and they're discouraged. God is promising them a glorious future, but they can't see any of it at that moment. "In its time I will do this swiftly," He tells them. Not when you think it should happen, or right away when you ask for it, but at the time that I have set for it, when it is the right time. Notice God doesn't tell them when that time will be, nor does He give them a date to look forward to. Instead, He simply asks them to trust in His promise and believe that this glorious future will come - in its time. We must trust and believe too, no matter what it is we are waiting for. We have been told "that in all things God works for the good of those who love him, who have been called according to his purpose" (Romans 8:28). That's our promise of a glorious future, just as the Israelites had been given, but this doesn't mean it will happen on our timetable any more than it was going to happen on their timetable. God doesn't give us a date to look forward to either. 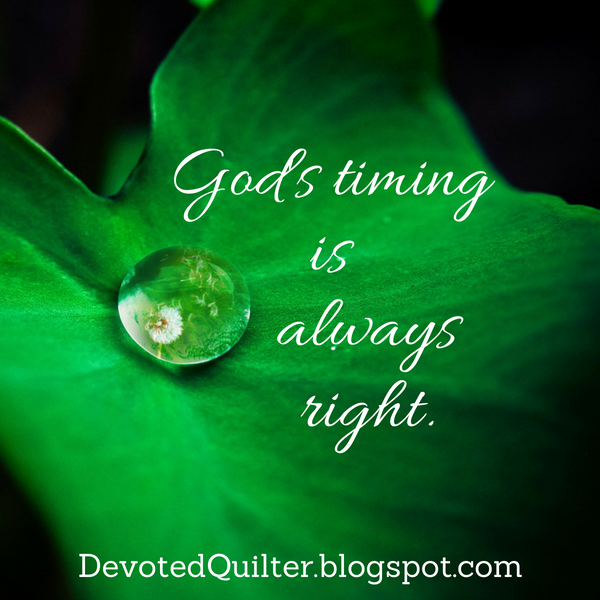 Waiting is hard, we certainly don't like it, and our culture seems set on making us ever more impatient, but God's timing is guaranteed to be the right timing. I am finding your weekly devotionals spot-on for me right now. Please keep them up!